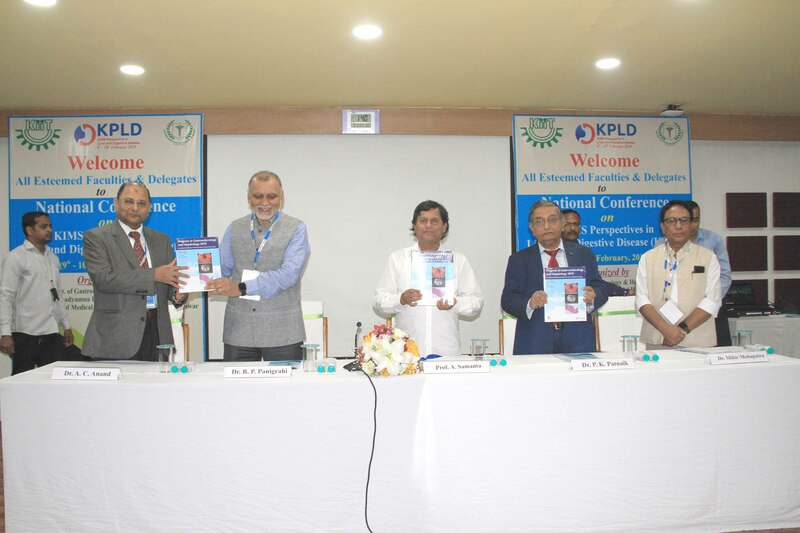 Bhubaneswar: The Department of Gastroenterology & Hepatology of Kalinga Institute of Medical Sciences (KIMS) recently hosted a national level conference on Liver & Digestive Diseases (KPLD). The two-day conference witnessed 11 interactive sessions that predominantly focused on the recent advances during the last 6 to 12 months in the field of Gastroenterology such as luminal (gastrointestinal tract), pancreas, biliary tract, and liver. The conference was inaugurated by Dr. Achyuta Samanta, Founder, KIIT & KISS on February 9, 2019, in the presence of Dr. B. Panigrahi, CEO, KIMS; Major General Dr. P. K. Patnaik, Principal; Dr. A. C. Anand and Dr. Mihir Mohapatra. The objective of the national level conference was to provide an opportunity to update knowledge and skill of young enthusiastic gastroenterologists and hepatologists especially the DM and DNB students, which would help them in the management of liver and digestive disorders across the country. Participants interacted with leaders in the field of Gastroenterology such as Dr. JB Dilawari, Dr. Manu Tandan, and Dr. MK Goenka during the conference, who are recognised for their work in the field. The conference brought researchers and clinicians working in diverse areas of digestive sciences under one umbrella with an aim to formulate new research questions for further research, which helped to bridge the current knowledge gap. It was a dedication of KIMS as part of KIIT Deemed to be University for research and education in GI Sciences. The conference was a successful result of sincere efforts by Prof Subrat Kumar Acharya, Pro-Chancellor, KIIT & Professor Emeritus, KIMS and Prof Yogesh Kumar Chawla, Chairman of Academics & Professor Emeritus to create a research and educational hub in Eastern India. A book titled “Progress in Gastroenterology & Hepatology 2019” which has been edited by Dr. Naresh Bhatt of Bangalore and Prof A C Anand from KIMS was released on the occasion.